CLOSE TO NATURE — Claire Weidner and Troy Sandman hold a fox snake while classmates look on at the summer enrichment class. 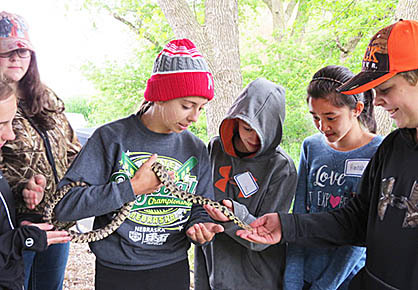 For the twenty-third year 42 incoming seventh and eighth graders from Boone Central and St. Michael’s took part in a summer enrichment program at Olson Nature Preserve on May 23-25. The students helped prepare meals, studied the seven ecosystems at ONP, conducted a “Homesteaders” project, and learned a variety of skills from corn shelling to rope making. The annual program is made possible by Boone Central Schools and the Albion Education Association. Details and more photos in the May 31 Albion News Print and E-editions.